The Board of Directors of the Delta Tau Delta Educational Foundation is pleased to announce the appointment of Steve Vedra, (Butler University, 2002), as president of the Foundation effective immediately. Steve will lead Foundation efforts in alumni engagement, annual fund raising, planned giving and strategic growth. "Steve has earned the respect and admiration of the Foundation Board. In the last two years, he has led our development staff in achieving results for the Annual Deltfund that are the best in the Foundation's 36-year history. His vision and leadership will help the Foundation grow to fund even more educational and leadership programs for Delt undergraduates," said Keith Steiner, Foundation Board Chairman. 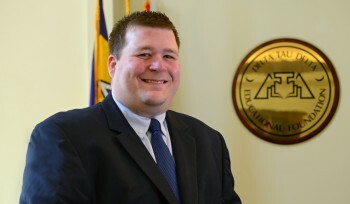 Steve joined the Delt Foundation staff in 2013 as the director of development. In his new capacity, he is charged with the growth of the Annual DeltFund, Major and Planned gifts, and special initiatives. As an undergraduate, Vedra was a founding father of Beta Zeta Chapter. During his collegiate years, he served as recruitment chairman, director of risk management, IFC representative and guide. He also attended the 2001 Leadership Academy in Norman, Okla. Following graduation, he hit the road for the Fraternity visiting more than 29 chapters as a Delts Talking About Alcohol intern. He has served as a chapter advisor, division vice president, conference volunteer and Presidents and Advisors Retreat facilitator.